Sierra Remodeling wants to make your work around the kitchen extremely relaxing (close to a zen moment) when the space is right. Enough room, the right colors, uncluttered. We especially like designing kitchens with a lovely view! Bring on the dishes and play some music! We offer three high quality lines of sinks including Elkay, Kohler and Swanstone. Are you ready to get your sink on? Call us at (520) 459-3164 and, visit our showroom floor for assistance with remodeling your kitchen. We are located at 1840 S. Highway 92 in Sierra Vista, Arizona! I am writing to let you know how much we enjoyed working with your employee, Scott Miller, during the planning and construction of our recent screened-in, extended patio project at our home in Winterhaven at Country Club Estates here in Sierra Vista. From the time of our first meeting, Scott represented your firm with the utmost of professionalism, competency, and congeniality. Before selecting a contractor, my husband and I researched and interviewed six contestant firms. Scott had me at our first meeting. He arrived at the appointed time (which we requested after our work hours, AND his), and had done his homework. He enthusiastically participated in the design of our extension, and offered suggestions that we hadn’t even considered. We had some special circumstances in that we had purchased a hot tub and had to increase the height of the structure (and the size of the planned doors) in order to accommodate the possible removal of the tub in the future. Scott’s response to that obstacle was, as always: “No problem, we can do it.” And he did! His drawings were FAR and above what any of the other contractors were able to develop, and once again, his competency and demeanor won us over. While you may consider his actions just “part of his job,” we certainly believe that he went over and above the demands of that job. During the project, Scott kept us informed every day of developments, and listened attentively and patiently to questions and requests at all times. All City forms were submitted correctly and approved promptly, and he presented us with a complete package that satisfied the stringent Winterhaven Homeowners Association requirements with NO modification, allowing the schedule to be met. Scott coordinated the services of all the required personnel expertly, including the men who poured cement for the foundation, the framers, the carpenters, the electrician, the drywall and stucco personnel, and the painters. He saw to it that all inspections were conducted (and passed) routinely. He got down on his hands and knees on a Saturday morning to help us design a tile pattern that would disguise the fact that we were not able to match our old tile. And, as my husband remarked to me on more than one occasion: Scott never failed to have something done when he said it would be, and he always had a can-do attitude. We’ve worked with quite a few contractors here in Sierra Vista, and I must tell you that the interest Scott showed in getting our project completed on time and to desired specifications is HARD TO FIND in the general population. As you know, at the end of the day, of primary importance is the success of the project, measured by the satisfaction of the client. I can assure you that Scott’s project – which he designed and saw through to completion — turned out to be all and MORE than we expected. We are completely pleased with our new addition, and will enjoy it for many years to come. Furthermoe, I will be extolling to everyone I know how well your firm, and especially Scott, performed for us, including a testimonial on the Winterhaven website where, from time to time, our neighbors request information about contractors for home improvement projects. Please extend our best wishes and thanks to Scott for his services, if you will. It was a pleasure doing business with your firm, and when we are ready to start another home project, we’ll call you first! 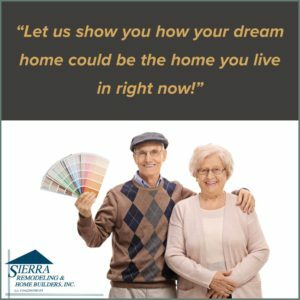 Contact Sierra Remodeling today for the highest grade of home remodeling.We proudly serve Sierra Vista and the surrounding communities in Cochise, Santa Cruz and Pima counties.Call (520) 459-3164 for your free consultation or contact us online.